Writer Kathy Y. Wilson in her East Walnut Hills apartment where she has amassed an art collection. Founder and Curator Dr. David Pilgrim in the Jim Crow Museum. On Sunday, January 14 the Weston Art Gallery will present "A Reading by Kathy Y. Wilson and Lecture by Dr. David Pilgrim" in the Aronoff Center's Jarson-Kaplan Theater. 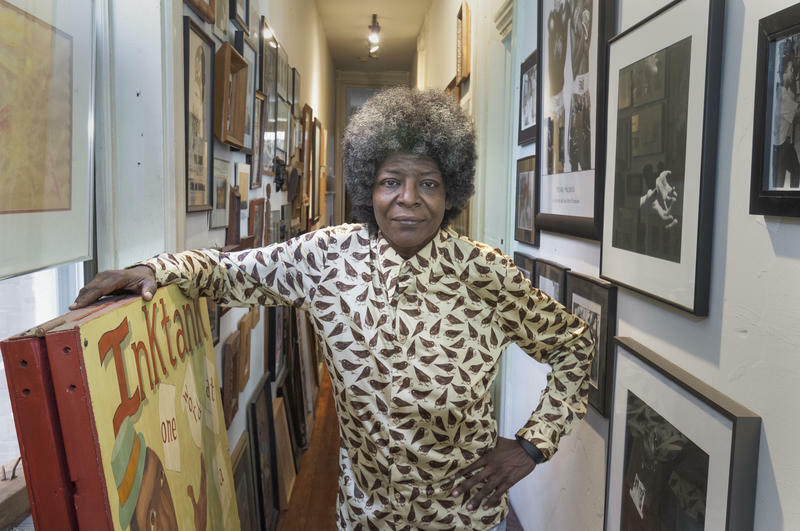 Wilson will read a new piece reflecting on her 52-year relationship with America, and lead a conversation with curator Buddendeck. Dr. David Pilgrim, vice president of diversity and inclusion at Ferris State University, will give a lecture on using objects of intolerance to teach tolerance. Dr. Pilgrim is the founder and curator of the Jim Crow Museum, an 11,000-piece collection of racist artifacts located on the campus of Ferris State University. Joining us to discuss Sanctuary and the upcoming lecture are Writer Kathy Y. Wilson and Ferris State University Vice President of Diversity and Inclusion Dr. David Pilgrim. The reading by Kathy Y. Wilson and lecture by Dr. David Pilgrim is Sunday, January 14 at 1:00 p.m. in the Aronoff Center for the Arts Jarson-Kaplan. Tickets are $20 and $15 for students. Following the presentation, an informal and free Sunday Salon with both speakers will take place in Wilson’s exhibition in the Weston Art Gallery from 3:00 to 5:00 p.m. For more information click here. The National Underground Railroad Freedom Center and MLK Coalition will host the 2018 King Legacy Awards Breakfast and honor the King Legacy Youth Leadership Class of 2017 on Monday, January 15. The morning's program features Deondra Kamau Means, Artistic Director of Education and Outreach at The Children's Theatre of Cincinnati. Doors open at 7:30 a.m, breakfast begins at 8 a.m. Tickets for the breakfast are $35 and seating is limited. For more information click here. To purchase tickets, call (513) 333-7706. RSVPs are requested by January 8.